« The digital adaptation of Onirim is now available! Find out Ticket to Ride: Germany, a new stand-alone board game in our well-known Ticket to Ride series. 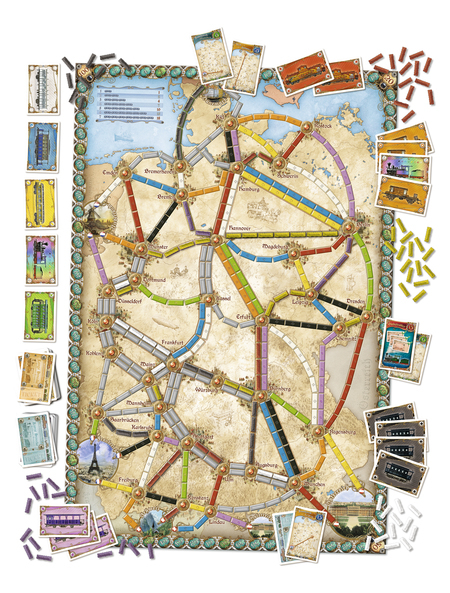 As in the other Ticket to Ride board games, players will build their own rail network, this time across a new beautifully illustrated board of Germany at end of the 19th century, to connect cities listed on their Destination Tickets. But that’s not all. Competitors need to watch out their opponents who might be trying to reach the same far-flung corners of the German empire and outwit them by collecting valuable Passenger Meeples from the cities faster than they can. Using the route network previously seen in the Märklin Edition, Ticket to Ride: Germany introduces a new and exclusive passengers rule. 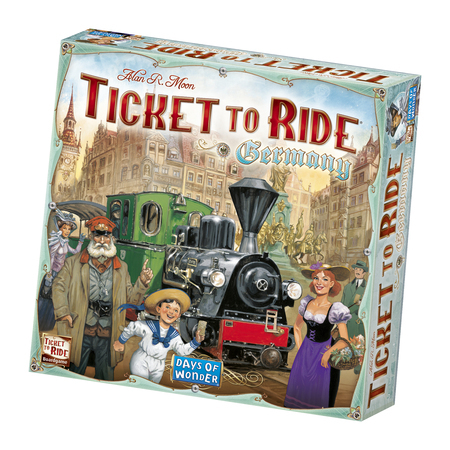 Additionally, the game includes short and long Destination Tickets to choose from, making Ticket to Ride: Germany a simple and elegant variant to the original game, with new challenges which will please newcomers and veterans alike. Ticket to Ride: Germany is a complete board game for 2-5 players and features a map of Germany, 225 colored Train Cars, 110 Train Car Cards, 89 Destination Tickets Cards, 60 Passenger Meeples, 1 Cloth Bag, 5 Scoring Markers, 1 Rules Booklet and a special Globetrotter Bonus Card. It is expected to be available in June in Europe and at the Gen Con in August for the US, at a suggested retail price of €44/$50. For more information, please visit the Ticket to Ride Germany web page. This entry was posted on Wednesday, April 12th, 2017 at 15:03 and is filed under Games, News, Ticket to Ride. You can follow any responses to this entry through the RSS 2.0 feed. Both comments and pings are currently closed.